This prototype home was displayed in Construmat 2007, a massive international building show. The environmentally-friendly design actually consists of two houses (or a house and an apartment) that boast a zero overall energy consumption rate due to geothermal and solar energy sources. 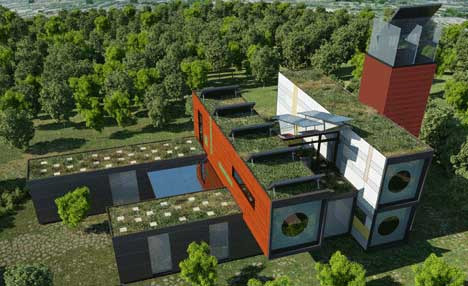 The R4House (the four Rs are reuse, recover, recycle and reasoning) is made of six recycled shipping containers and other sustainable and recycled materials.